To commemorate this year’s One Book Villanova selection, The Glass Castle by Jeannette Walls, Joanne, the member of the Events and Outreach team responsible for displays and special design projects, created a window display in the large case at the entrance to Falvey. The display focuses on four passages in the memoir which Joanne found most heart wrenching. The window’s top left panel illustrates how Rex Walls, Jeannette’s father, when money was especially tight, had his each of his children select a star as a Christmas gift because a star is a lasting gift. Floating above and around this panel are stars and tags listing the children’s names. At the top right is a drawing of a castle (Walt Disney World Fantasyland Castle, west elevation) that Joanne purchased from e-Bay. This drawing relates to Rex Wall’s promise to build a glass castle for his family, as the adjacent text relates. Below these, another panel shows how Rex Wall planned to build a device that would sift dirt and rocks and extract gold nuggets, with Joanne’s interpretation of the device. 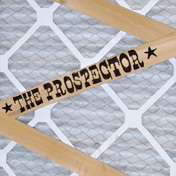 This object, labeled “The Prospector,” was built by Joanne’s twelve-year-old son, Conor. Scattered throughout the window are geodes representing Jeannette’s treasures and metaphoric pieces of pyrite (fool’s gold), as well as symbolic castle-shaped objects which refer both to the book’s title and to the family’s unrealized dream. Ann Stango, a member of the Access and User Assistance team who formerly did displays for QVC, assisted Joanne in mounting the display.